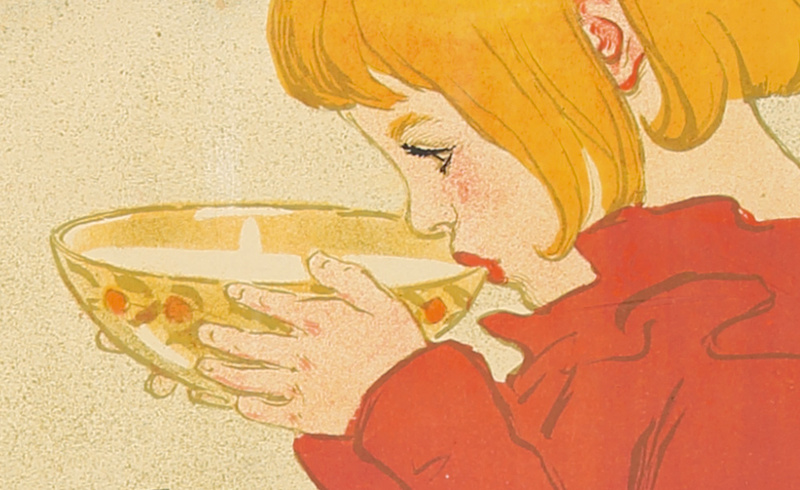 Joseph “Joe” Eula (1925–2004) was an American fashion illustrator and poster designer. He was prominent in the 1960s and 70s, owing to his impressive resumé: creative director at Halston for ten years; illustrator for the New York Times, American Vogue, and Italian Harper’s Bazaar; and designer for his friends in the music world. 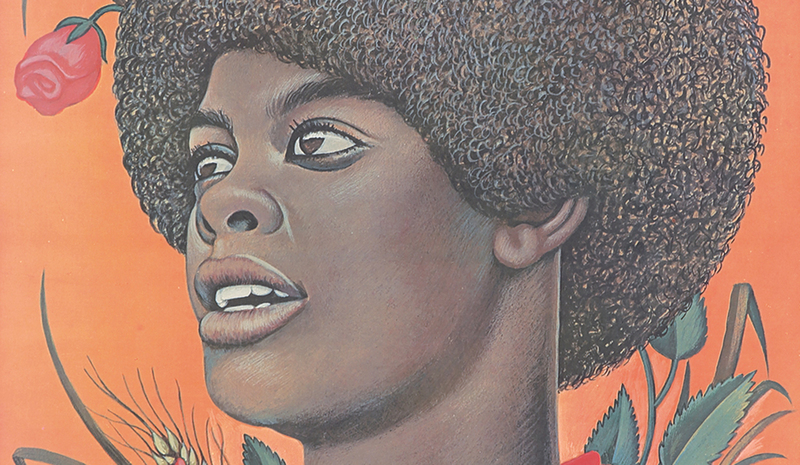 For Miles Davis, he designed a custom suit and the album cover for “Sketches of Spain.” He also made concert posters for The Supremes and Liza Minnelli, among others. He championed a downtown go-go New York style with his crisp lines and bursts of bold color. The Supremes / Lincoln Center. 1965. 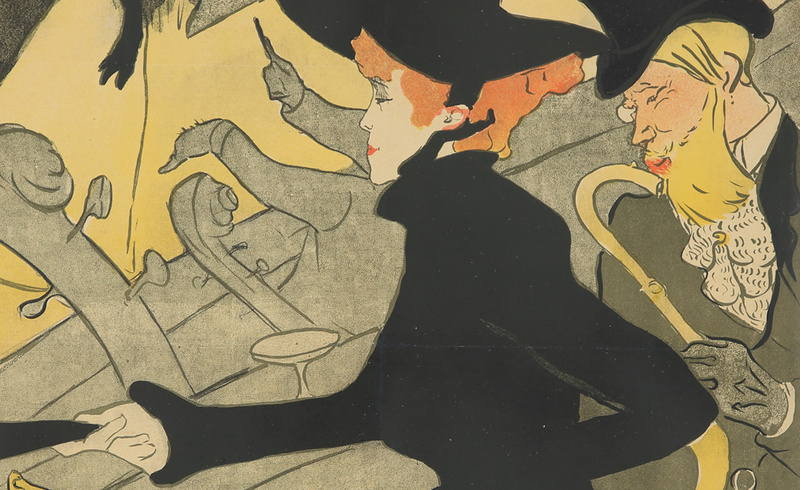 While best known for his fashion plates, Eula also created a variety of nightlife and concert images. 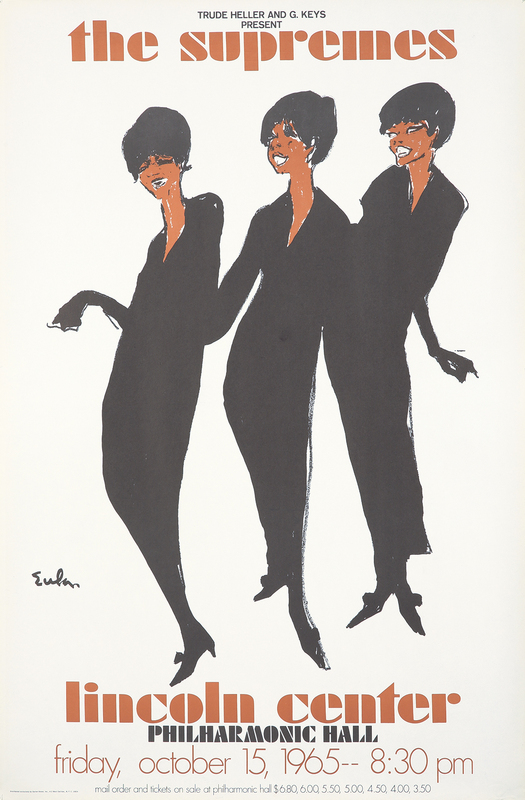 Here, he depicts the legendary Supremes for their sold-out show at Lincoln Center. Bobby Short / The Living Room. 1966. 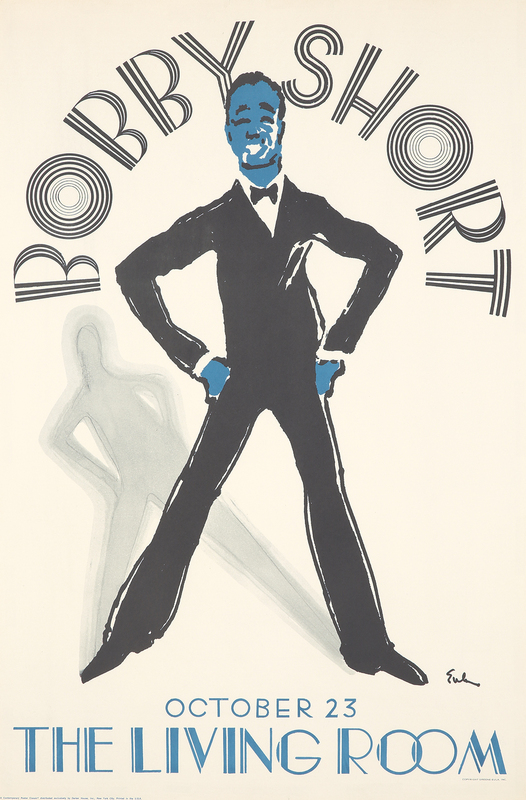 Eula was a good friend of Bobby Short, so much so that he designed the invitations for the cabaret star’s 80th birthday party. Here, he creates a vivacious and dynamic image of the entertainer’s stint at New York’s popular Living Room. 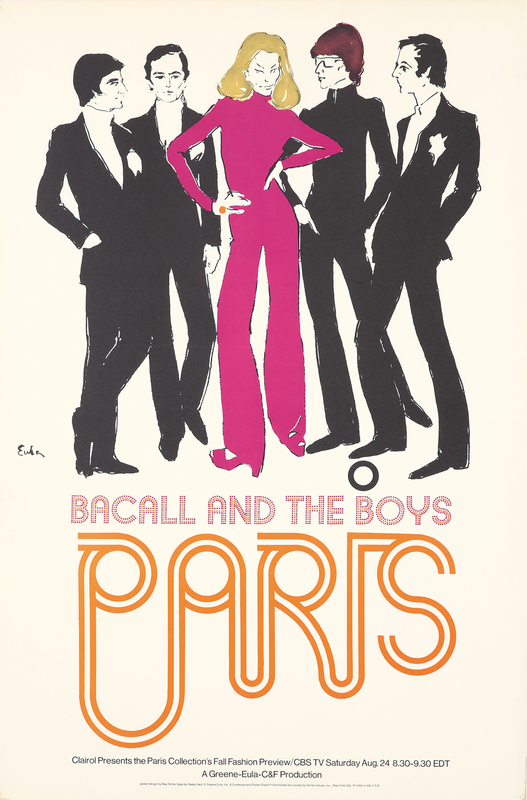 Bacall and the Boys / Paris. 1968. What better way to while away a hot pre-Labor Day Saturday night than by watching Lauren Bacall present a preview of the Fall Paris fashion collections? The hour-long network television presentation was a joint production of Eula himself and fashion photographer Milton Greene. 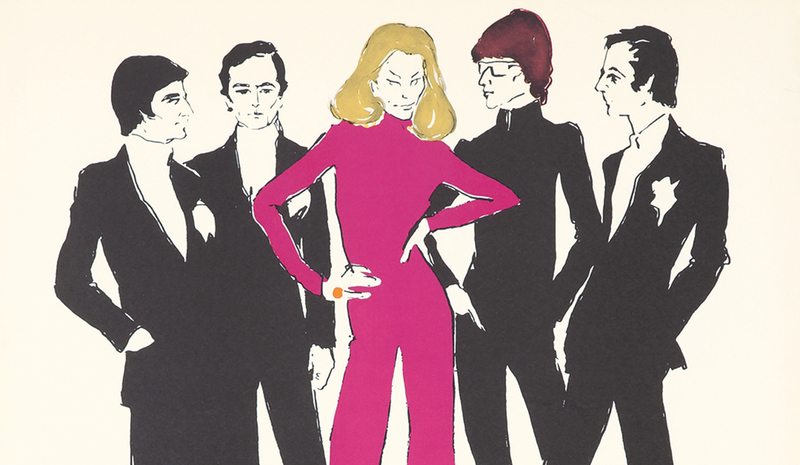 Eula shows the feline Bacall flanked by designers Yves St. Laurent (behind shades), Emanuel Ungaro, Marc Bohan (for the house of Dior), and Pierre Cardin. For fashion followers, Bacall’s slinky hot-pink, bell-bottom jumpsuit instantly captures the period. The poster design is by Bea Feitler—one of Milton Glaser’s many protégés who have become brilliant graphic designers in their own right. She set Eula’s artwork off with Art Nouveau-mod typography by Dewey Seid. The Mod Ball / The Rainbow Room. 1965. 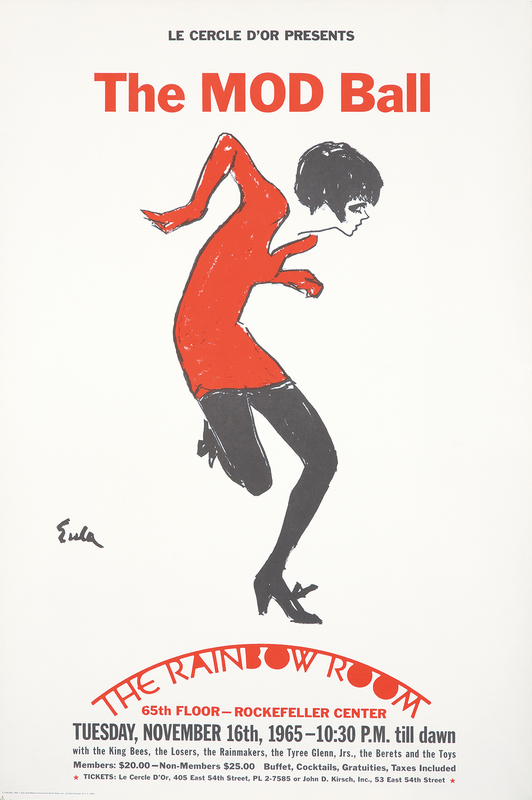 The dancing miniskirted figure is a superb example of the loose, evocative illustrative style that made Eula highly sought after by fashion and theatrical clients alike during New York’s go-go 1960s and 70s. This dance-til-dawn event was a production of the Cercle d’Or Club, run by Olivier Coquelin, the high-octane Frenchman who single-handedly created the city’s discotheque scene in those years. Coquelin’s establishments included Le Club, Hippopotamus, and Cheetah.